The Celtic year is divided into thirteen lunar months, each represented by a sacred tree. 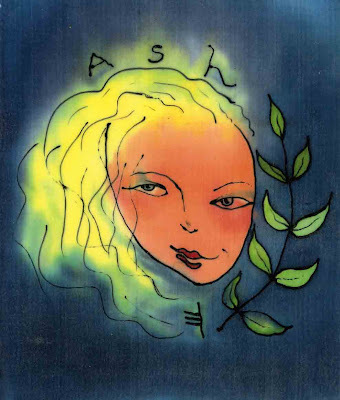 The Ash Moon month occurs from February 19th to March 19th. The Druids of ancient Celtic Britain invented a rune alphabet called the "ogham alphabet" which was composed of 13 consonants taken from the letter names of the 13 sacred trees that represented the 13 lunar months. There are also 5 vowel trees that separate the year into it's respective seasons along with a 19th tree for the extra day of the year following the Winter Solstice. The Ash Tree is the sacred tree representing the third lunar Moon, the "Moon of Floods" and is associated with the Spring Equinox. The Ash is sacred to Poseidon, god of the sea and the Ash affirmation is, “I am a wind on the sea.” It is an oracular tree associated with thunderstorms and lightening and has many versatile uses. It has been used to make Druidic wands, for rain making ceremonies, for coracle-slats (a coracle is a small rounded boat made of hides stretched over a wicker frame still used in some parts of Great Britain today), for making king’s thrones, and for the shafts of weapons and spears. It is also one of the best woods for making a fire. Working with the emotional and watery energies of the Ash moon can lead to self wisdom. It’s healing secret is, “From the viper’s poison comes the tonic of life.” The emotional turmoil that accompanies this Moon can teach us a great deal about our inner self so that we can express who we are more honestly. I painted all my Celtic tree Goddess images on silk that I laminated and made into a hand lettered, one-of-a-kind book titled "The Celtic Tree Year." 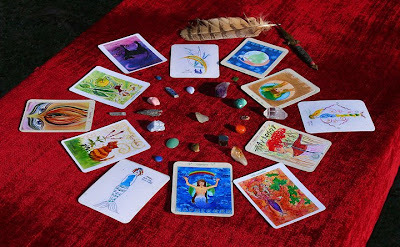 I have also created an oracle deck from these paintings (almost 12 years later) and am using these oracle cards in my soul readings. To read more Celtic Tree Year posts please click here.